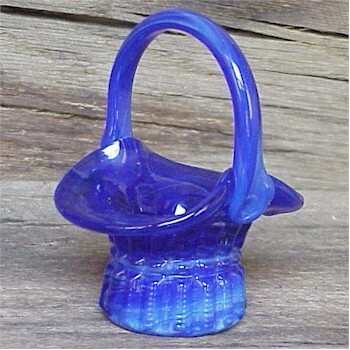 Cobalt Slag Mini Basket, Bargain Shack offers Boyd Glass, Mosser Glass, L.G. Wright, and Contemporary Collectible Glass including Vaseline Glass - J.B. Scottie Dogs, Pooche, Animal Covered Nests, Toothpick Holders, Salts, Glass Animal Figurines, Clowns, Dolls, Slippers, Vehicles, and More! This rich cobalt and milk slag Mini Diamond Pattern Basket from Gibson Glass is beautiful! It stands 4-1/4 inches tall with a great hand applied handle. It would be a wonderful addition to any slag glass collection and would even make a great toothpick holder. The bottom is marked Gibson 2004. The slag varies on each basket. Gibson Glass went out of business several years ago so be sure to add this one to your collection.